Although we boast the ability to fix anything with a power button, sometimes we take a crack at things without a power button as well. A customer brought a Snoopy and Woodstock touch tone phone into the the Haywood, South Carolina store. 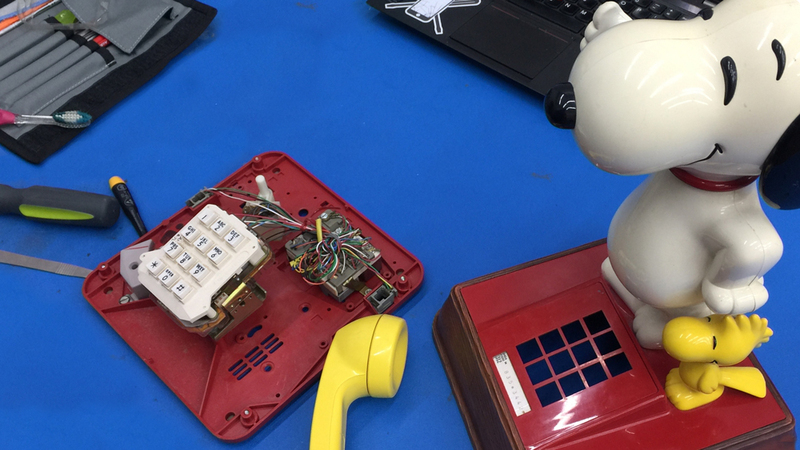 The customer wanted to see if they could be fixed so she could use them in her home, but the phones were made in 1976 and their age posed a difficult problem. Old touch tones are built on an analog system. Analog phones transmit voice as electrical signals by converting them from sound waves into analog electrical waves. They move through telephone wires and are converted back into sound waves by the handset of the receiver. More modern digital devices break voice signal down into binary and transfer it to the other receiver where it is reassembled. This system is better at correcting any errors that may have occurred during the data transfer, making calls and connections clearer. With the wiring of digital landlines, it doesn’t matter what colors are connected to each other because they have autocorrecting features. Analog phones do not have this feature so the wires have to be connected to the corresponding polarity. From the pictures, it’s obvious why this was a small problem. The wires are colored, but the colors do not indicate the polarity of the wires. The team had to guess and check the polarity of the wires and route them correctly. The motherboard components were also a little rusty and in need of a cleaning. Ultimately, the team was able to get Snoopy working and although she’ll never get the clear call quality that comes with a digital phone, the customer was ecstatic to be able to use Snoopy and Woodstock in her home again.